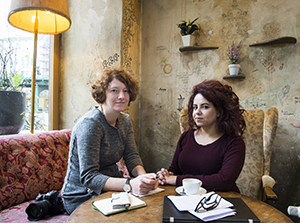 Hiba Obaid & Inga Alice Lauenroth - wearedoingit e.V. Hiba Obaid is a palestinian-syrian jorunalist. She studies Arabic literature at the University of Aleppo and has written for magazines and newspapers in Syria, Turkey and Germany. She has been living in Berlin, Germany since October 2015. Currently working at Deutschlandfunk-Kultur and writing for „Die WELT“ and many more. Inga Alice Lauenroth is a photographer who lives and works in Berlin. She studied photography at the Ostkreuzschule in Berlin and is the founder of several photographer collectives.